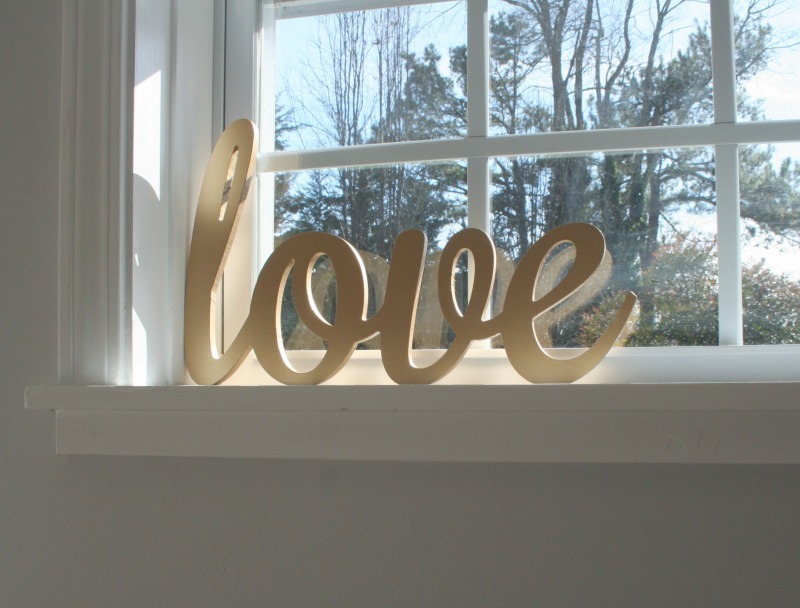 I am partnering with Oriental Trading to bring you ideas for affordable Valentine's decor. All thoughts and opinions are my own. Now that Christmas is over and I have taken down all the decorations, the house looks so bare. 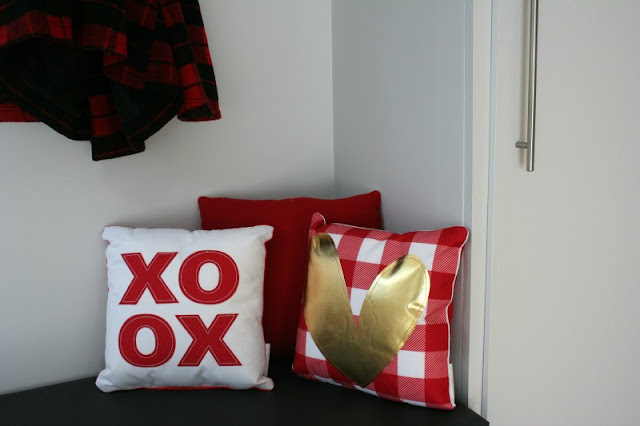 I decided to add a little bit of cheer back into my entry way with some Valentine's decor. We have been enjoying our recently completed mudroom space, so I thought it would be the perfect place to add some pops of red and gold. 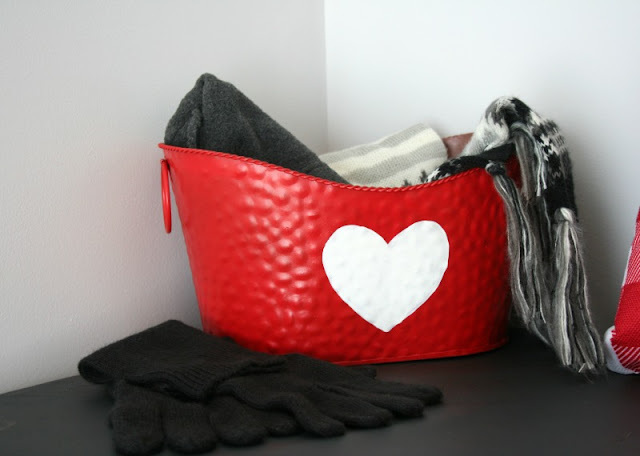 I used the largest bucket in a set of 3 rustic red pails to hold scarves, hats, and gloves for easy access. I am a sucker for wooden calligraphy signs, so I had to grab this gold "love" one. It comes with hooks on the back to hang it, but I thought it was the perfect size to sit in the window. 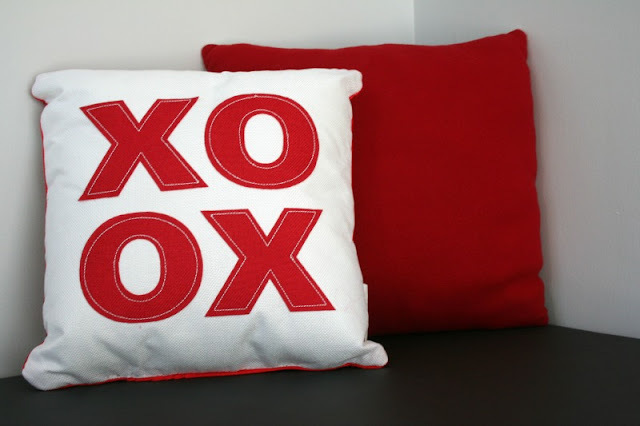 I had a red Christmas pillow that I added to a set of small Valentine's throw pillows. I can't decide if I like them better nestled in the corner or spread across the back of the bench. 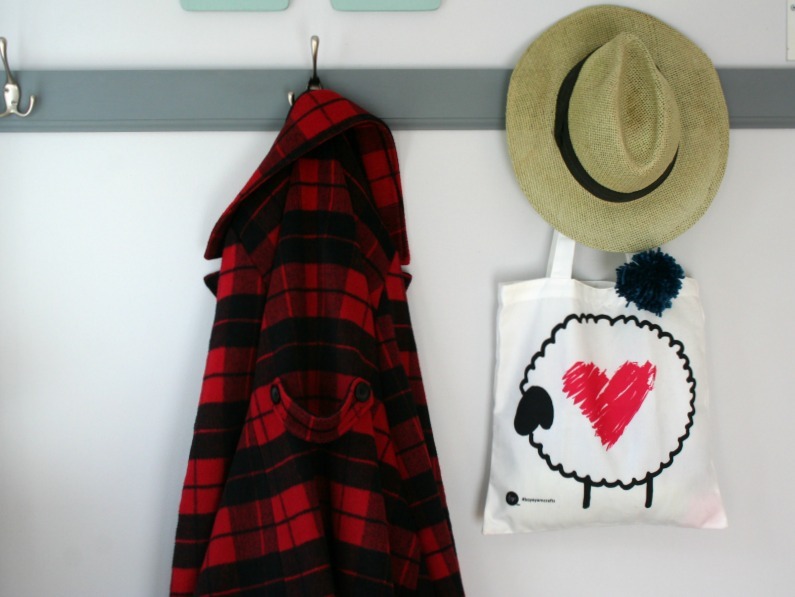 I had to pull out my red checkered buffalo plaid wool coat and re-usuable tote that has a heart on it because it fits the theme perfectly! Do you decorate your entry for Valentines Day? 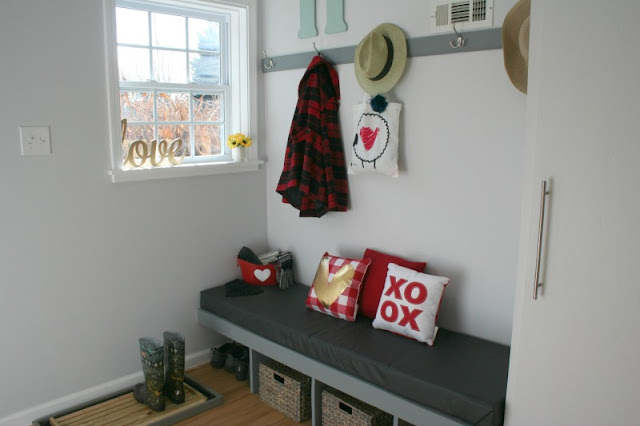 This is SUCH a cute space, Mary! One of my favorite projects you've ever done! 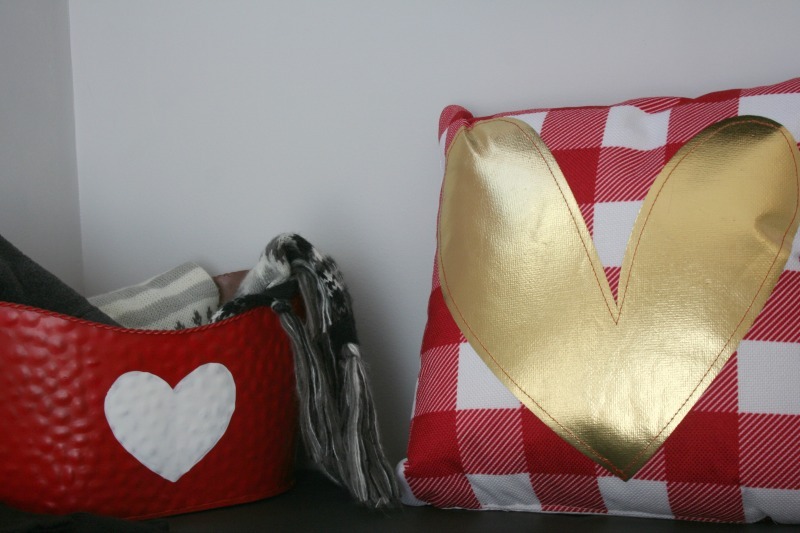 I love those stackable red metal buckets with the hearts on them! So cute! Thank you so much! 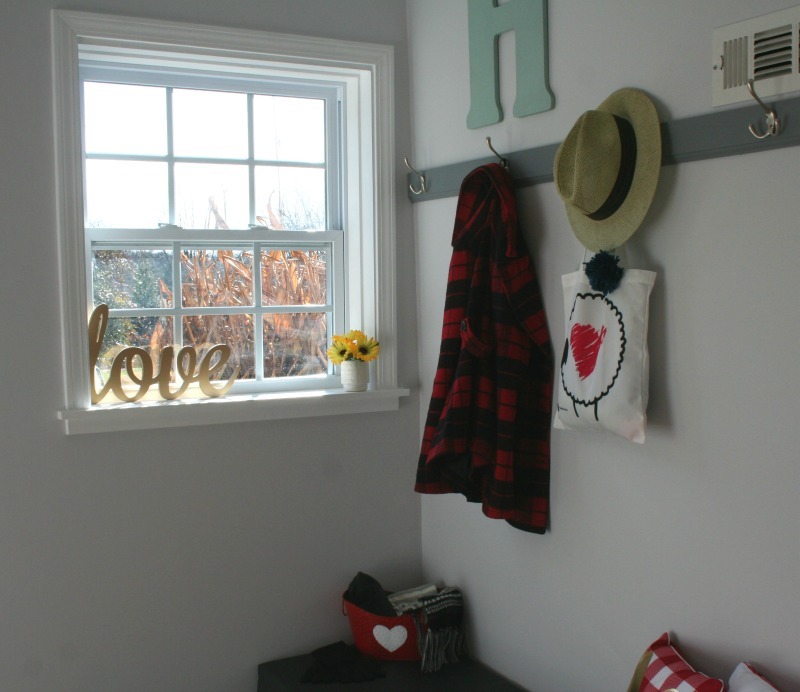 The buckets are so cute and functional! 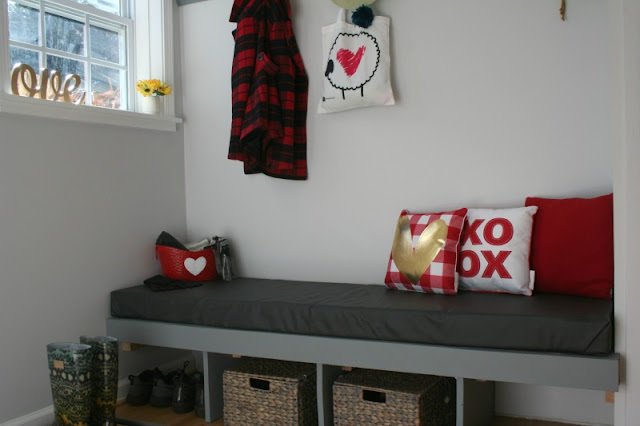 I love that you have a little area to alter around the holidays! 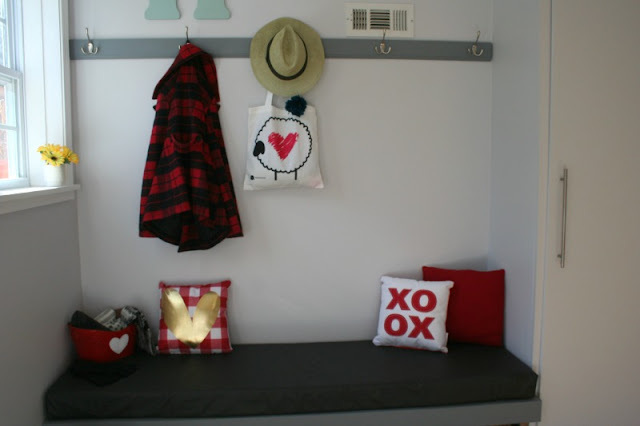 One day I hope to too :) I love that heart pail and could use one since we have tons of little mittens and hats for Winter floating around, lol. Me too! It is a fun little area and the bucket comes in handy!